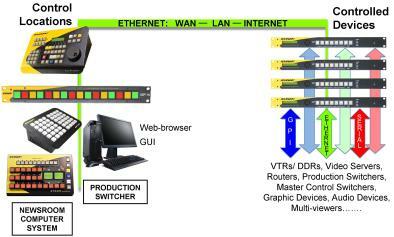 Real Time – Reliable – Dependable – Precise – Modular Ethernet machine control designed for the demands of television broadcast, live production, and event production. Add and change devices, device control protocols, and control points whenever and wherever you want without disrupting your workflow. Flex’s common control interface masks device protocol differences, letting you take control no matter what the protocol, device, or manufacturer’s brand. Flex is your alternative to running more multiconductor cables through already crowded cable troughs, filled computer floors, or packed ceilings. Flex connects operators to equipment – VTRs, video servers, routers, etc – over an Ethernet, LAN, WAN, or VPN connection providing real-time, precise, and reliable control. Device Controller – responsible for interfacing to and directly controlling equipment over a GPI, RS232, RS422, or Ethernet control interface. It is responsible for supporting the many and incompatible control protocols found in a facility. Control Panel – provides a familiar, tactile user interface that is intuitive, easy-to-use, and provides fast, reliable, and precise control.